Most buttons are one inch in diameter and weigh .10 ounces each. Buttons are round, not square like most of the pictures make them look, and the little numbers next to the image do not appear on the finished product. A few of the more expensive buttons you can assume are 2 inches in diameter. Sometimes the buttons do not look exactly like the pictures, or the background color may be slightly different, or the image reversed, etc. If you have any questions, feel free to ask. Stickers are mostly screenprints on vinyl, ranging in size from 2 x2 inches to 4.5 x 4 inches. Some of the long, thin ones are either 1 x 9 or 2 x 9 inches. A few are slightly different sizes and materials. All are made by rebellious, interesting organizations and good peeps. Brand New! Until we get our shipping calculator integrated, the shipping prices for this item may be adjusted (see item weight). We apologize for the inconvenience and will contact you in the event we need to request additional shipping funds. Also, all of our gear drop ships from Idaho, and will thusly not be shipped along with your book order. Made of Tristan, a resin polycarbonate plastic similar to Lexan, for virtual indestructibility. However this has the advantage of being BPA Free. The plastic will also not absorb flavors and smells. Lid threads attach directly to MSR or Katadyn water filters. Graduated measures in both ounces and milliliters are on the bottle. A short, snappy handbook detailing why the military may need you, but you really don't need it. "The Army's top recruiter, already struggling to meet his quotas this year, said ….that 2006 would be even harder, and perhaps the toughest year for recruiting since the all-volunteer force began in 1973. "—The New York Times, May 13, 2005 So you're walking out of school and parked at the gate is a new, bright red Ford Mustang with a hulk of a man in the front seat. He's sporting a razor cut and wraparound shades. Before you can pass he's out of the car and blocking your path. "Mind if I take a minute"—he has you by the arm now—"to tell you about the great life in today's Army and why you should seriously think about signing up?" The armed forces are having a tough time attracting new recruits lately, in no small part due to the mess in Iraq. Young people are getting wise to the many excellent reasons not to join the U.S. Military, and this handy book brings them all together, combining accessible writing with hard facts and devastating personal testimony. Contributors with firsthand experience point out the dangers facing soldiers, describe the tricks used by recruiters, and emphasize that there really are other options, even in a sluggish economy. It's essential reading for anyone thinking of signing up. Over 2,000 American soldiers have been killed in Iraq, and over 14,000 have been wounded. • Nearly 100,000 civilians have been killed in Iraq as a result of the U.S. invasion. • One in six soldiers returning from Iraq experiences mental health problems. • Two-thirds of all recruits receive no college funding from the military, and only 15 percent graduate with a four-year degree. • According to the VA, 90 percent of recent women veterans reported experiencing sexual harassment; a third were raped. A veritable “Globalization for Dummies,” 10 Reasons to Abolish the IMF & World Banklays bare the most common myths of globalization in a clear and understandable way.Looking with hope to grassroots movement-building on a global scale, Danaher presents ten arguments for abolishing the IMF and World Bank and replacing them with democratic institutions that would make the global economy more accountable to an informed and active citizenry. Conceived as an effort to educate the public about how international institutions of “free trade” are widening the gap between the rich and poor globally, Danaher reveals how the lending policies of the IMF and the World Bank fail to benefit Third World peoples, and instead line the pockets of undemocratic rulers and western corporations while threatening local democracies and forcing cuts to social programs. Through anecdotes, analysis, and innovative ideas, Danaher argues that the IMF and the World Bank undermine our most basic democratic values, and calls for reframing the terms on which international economic institutions are operated using the principles of environmental sustainability, social justice, and human rights. Steampunk is a burgeoning counter-cultural movement; a genre, community, and artform. The Steampunk movement seeks to recapture the spirit of invention, adventure, and craftsmanship reminiscent of early-nineteenth century industrialization, in part, to restore a sense of wonder to a technology-jaded world. 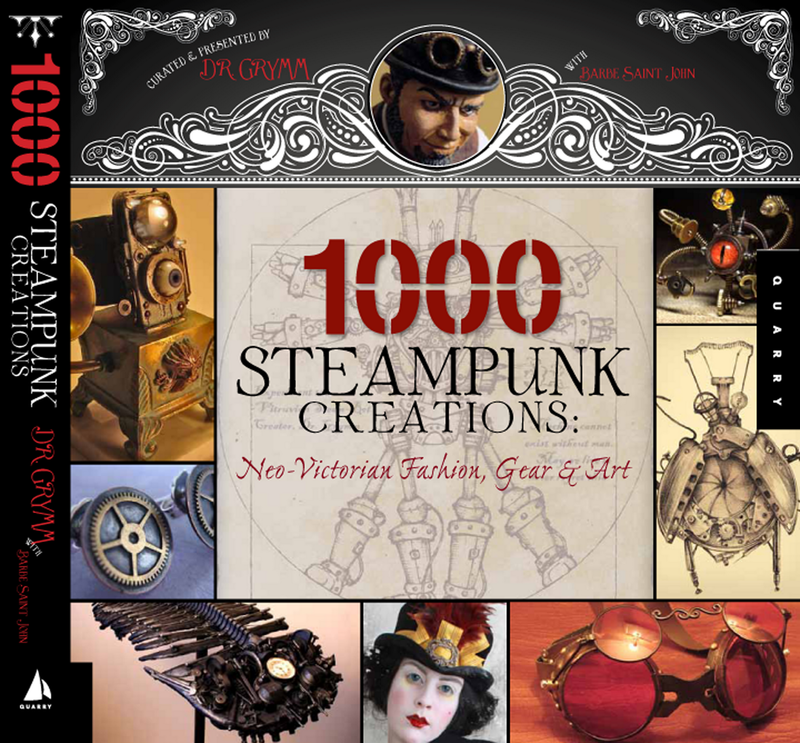 Packed with 1,000 color photographs, 1,000 Steampunk Creations features a showcase of stunning jewelry, fashion, accessories, headgear, artwork, home decorations, and curious contraptions. Why do we overeat time and time again? Why do we make poor diet choices while we want to be healthy? What makes losing weight so difficult? These and many other vital questions are addressed in 12 Steps to Raw Foods in an open and sincere dialogue. Based on the latest scientific research, Victoria Boutenko explains the numerous benefits of choosing a diet of fresh rather than cooked foods. This book contains self-tests and questionnaires that help the reader to determine if they have hidden eating patterns that undermine their health. Using examples from life, the author explores the most common reasons for people to make unhealthy eating choices. Rather than simply praising the benefits of raw foods, this book offers helpful tips and coping techniques to form and maintain new, healthy patterns. Learn how to make a raw food restaurant card that makes dining with co-workers easy and enjoyable. Discover three magic sentences that enable you to refuse your mother-in-law s apple pie without offending her. Find out how to sustain your chosen diet while traveling. These are only a few of the many scenarios that Boutenko outlines. Written in a convenient 12-step format, this book guides the reader through the most significant physical, psychological, and spiritual phases of the transition from cooked to raw foods. Embracing the raw food lifestyle is more than simply turning off the stove. Such a radical change in the way we eat affects all aspects of life. Boutenko touches on the human relationship with nature, the value of supporting others, and the importance of living in harmony with people who don t share the same point of view on eating. Already a classic, this enhanced second edition is aimed at anyone interested in improving their health through diet. High intensity 12 volt emergency auto light. Plugs into the cigarette lighter. Use with the folding tripod stand in handle or the hook or magnetic back. Ideal for the car, garage, boat or RV. This handy new pick set is the most popular set among professional locksmiths today. This kit consists of 12 different tools housed in a handsome black leather case designed for a shirt pocket. Included in the price, you receive a 5 piece warded key set and a copy of the book "LOCKPICKING SIMPLIFIED" "17 piece set total." Discussing the legacy of Columbus, including 500 years of indigenous resistance, â€œbothers the defenders of Western civilization, those people who have benefited from Western civilization, or who think they will benefit from it in some way. They are bothered by the fact that more and more Americans want to look at what happened then from a different point of view. Because weâ€™ve been looking at it from one point of view for all these hundreds of years, looking at slavery from a white point of view, at Columbus from a white point of view, at women and the issue of sexual equality from the male point of view, looking at history from very specific, limited points of view. People have begun to look at history from the point of view of those people who have been invisible, overlooked, oppressed.â€� â€”Howard Zinn, from the CD. In this instant classic, recorded on the eve of the quincentennial, legendary historian Howard Zinn returns to the themes he popularized in his masterful A Peopleâ€™s History of the United Statesâ€”how we interpret history, and what that tells us about the struggles of the vast majority of folks typically written out of the narrative. With his trademark wit, erudition, and generosity, he stands history on its head, to better illuminate, understand, and act upon the past, present, and future. Made from strong, alloy steel this Pry Bar provides the extra leverage needed to help lift andÂ separate heavy objects or pull nails. Long enough to do the job while short enough for easy inclusion in your camping gear and vehicles' emergency kits. Helps to pry open doors and windows. 15 inches. Full tang, namely the blade is one piece of hardened steel that extends to the tip of the handle. Two halves of a comfortable plastic grip are secured to each side of the proximal blade. This is the strongest of the tang types. The perfect tool for cutting brush, saplings and undergrowth. The blade itself is 18 inches and the total length including the handle is 23 inches. 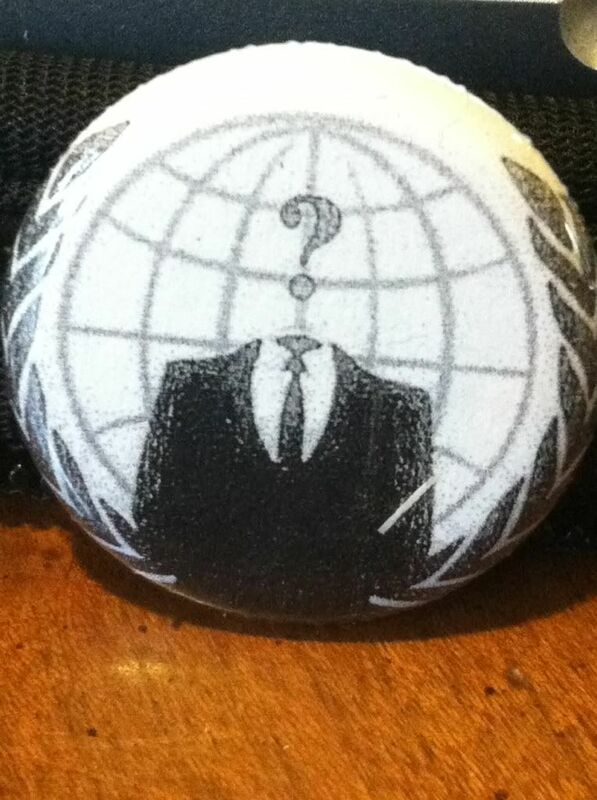 A 1â€� button featuring Anonymous' logo. Anonymous (used as a mass noun) is an Internet meme that originated in 2003 on the imageboard 4chan, representing the concept of many online and offline community users simultaneously existing as an anarchic, digitized global brain. It is also generally considered to be a blanket term for members of certain Internet subcultures, a way to refer to the actions of people in an environment where their actual identities are not known. In its early form, the concept has been adopted by a decentralized online community acting anonymously in a coordinated manner, usually toward a loosely self-agreed goal, and primarily focused on entertainment. Beginning with 2008, the Anonymous collective has become increasingly associated with collaborative, international hacktivism, undertaking protests and other actions, often in retaliation against anti-digital piracy campaigns by motion picture and recording industry trade associations. Actions credited to Anonymous are undertaken by unidentified individuals who apply the Anonymous label to themselves as attribution. Although not necessarily tied to a single online entity, many websites are strongly associated with Anonymous. This includes notable imageboards such as 4chan, their associated wikis, EncyclopÃ¦dia Dramatica, and a number of forums. After a series of controversial, widely-publicized protests and distributed denial of service (DDoS) attacks by Anonymous in 2008, incidents linked to its cadre members have increased. In consideration of its capabilities, Anonymous has been posited by CNN to be one of the three major successors toWikiLeaks. A 1â€� button featuring a sketch of D.B. Cooper from an old FBI Most Wanted poster. D. B. Cooper is the name popularly used to refer to an unidentified man who hijacked a Boeing 727 aircraft in the airspace between Portland, Oregon and Seattle, Washington on November 24, 1971. He extorted $200,000 in ransom and parachuted to an uncertain fate. Despite an extensive manhunt and an exhaustive (and ongoing) FBI investigation, the perpetrator has never been located or positively identified. The case remains the only unsolved air piracy in American aviation history. 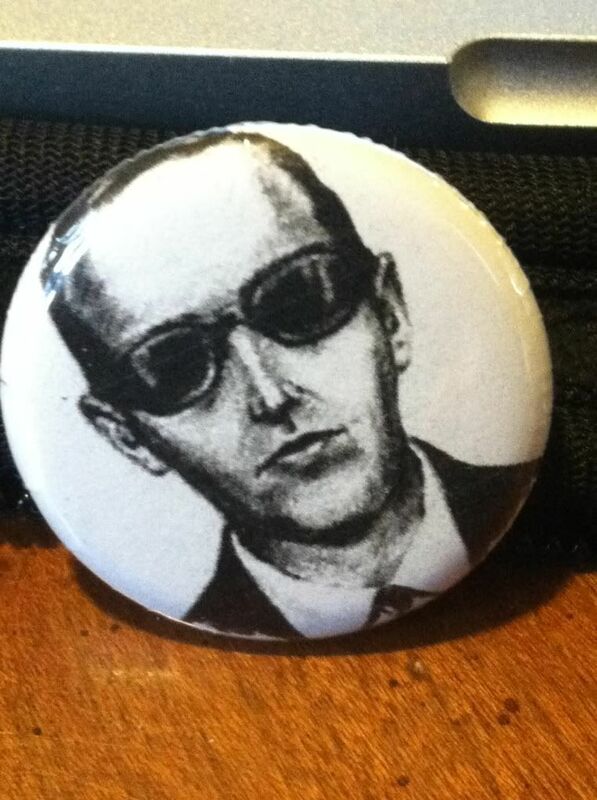 The suspect purchased his airline ticket under the alias Dan Cooper, but due to a news media miscommunication he became known in popular lore as D. B. Cooper. Hundreds of leads have been pursued in the ensuing years but no conclusive evidence has ever surfaced regarding Cooper's true identity or whereabouts, and the bulk of the ransom money has never been recovered. Numerous theories of widely varying plausibility have been proposed by experts, reporters, and amateur enthusiasts. While FBI investigators have insisted from the beginning that Cooper probably did not survive his risky jump, the agency maintains an active case fileâ€”which has grown to more than 60 volumesâ€”and continues to solicit creative ideas and new leads from the public. Maybe a hydrologist can use the latest technology to trace the $5,800 in ransom money found in 1980 to where Cooper landed upstream, suggested Special Agent Larry Carr, leader of the investigation team since 2006. Or maybe someone just remembers that odd uncle. 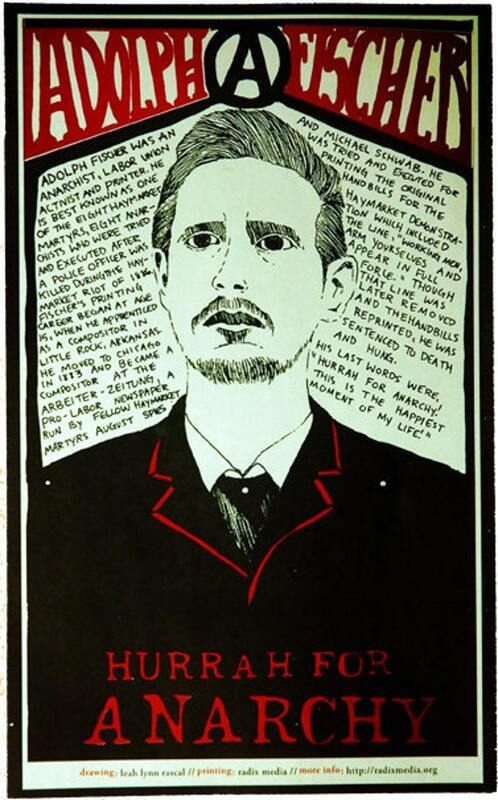 A beautiful two-color poster about Adolph Fischer, best known as one of the Haymarket martyrs of 1886. This is part of the Radical Printer Poster Series, published and printed by Radix Media. 2-color offset print on recycled natural-colored paper. 10.5 x 15.5. Drawing by Leah-Lynn Rascal. 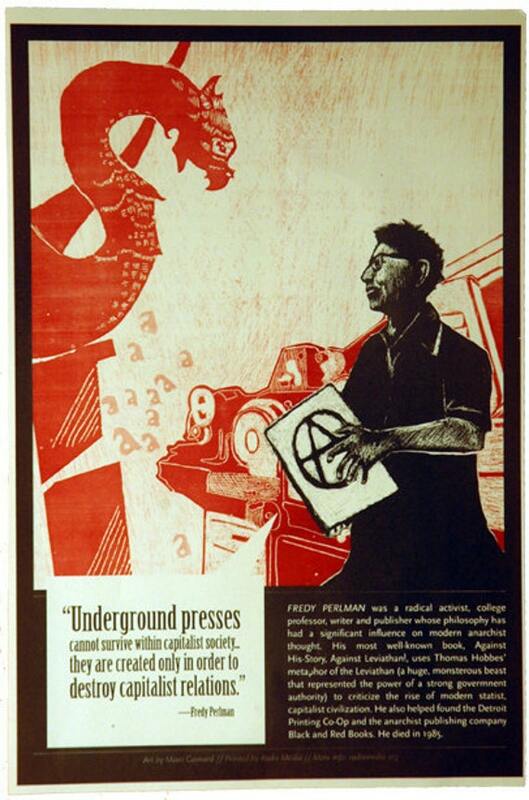 Two-color offset printed poster in remembrance of Fredy Perlman, who helped found the Detroit Printing Co-Op and Black & Red Books. 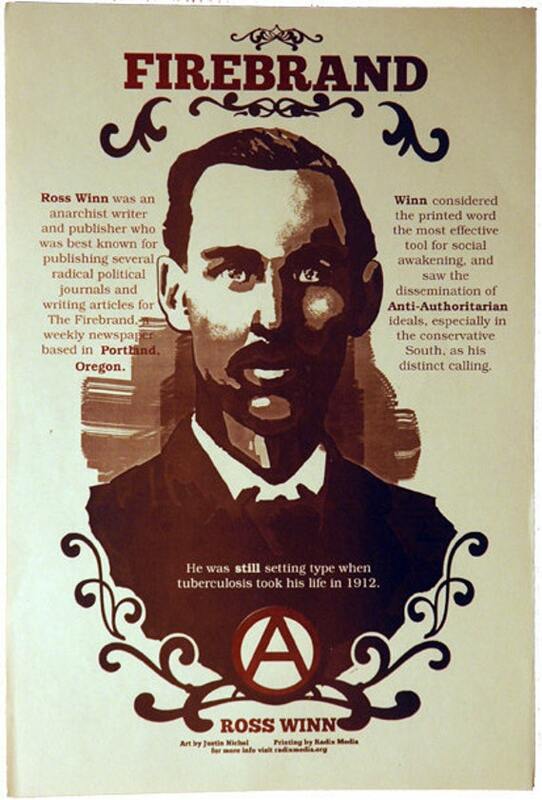 Part of the Radical Printer Poster Series, published and printed by Radix Media. 2-color offset print on cream-colored recycled paper. 10.5 x 15.5. Art by Marri Gamard. 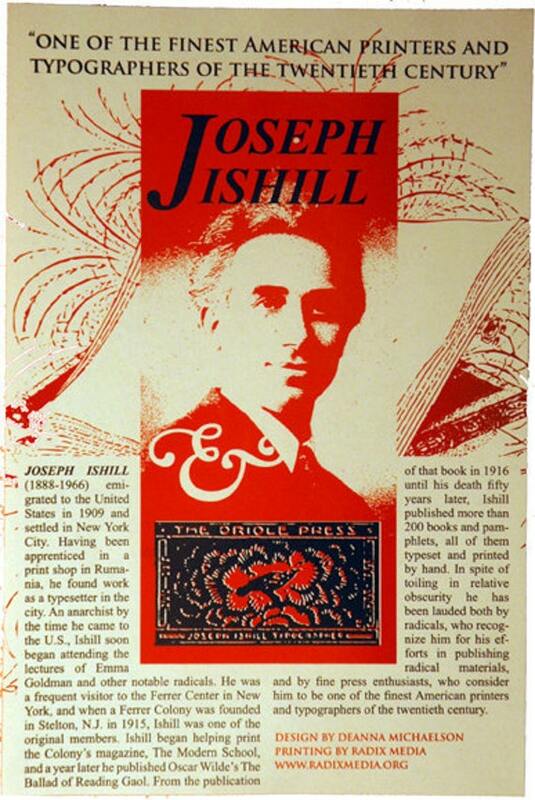 Two-color offset printed poster dedicated to Joseph Ishill, legendary among printers and typographers. This is part of the Radical Printer Poster Series, published and printed by Radix Media. 2-color offset print on recycled natural-colored paper. 10.5 x 15.5. Design by Deanna Michaelson. 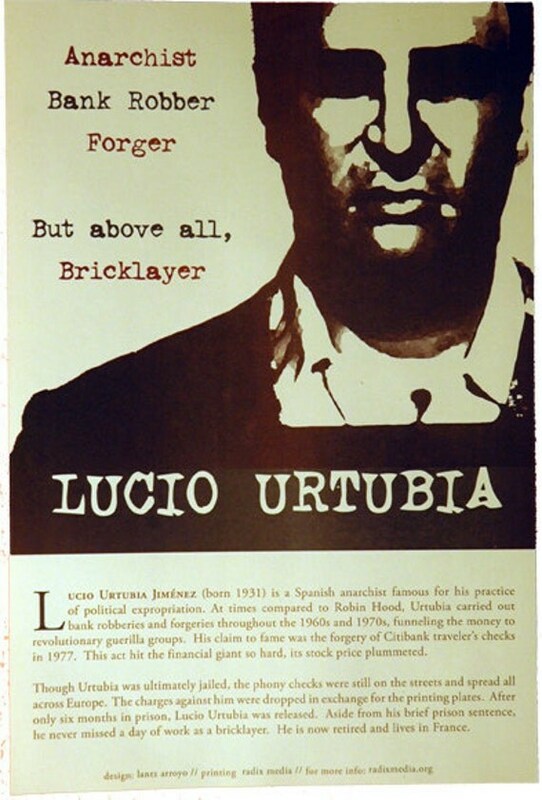 This stunning poster of Lucio Urtubia is a tribute to the anarchist printer that went up against Citibank...and won. Part of the Radical Printer Poster Series, published and printed by Radix Media. 2-color offset print on cream-colored recycled paper. 10.5 x 15.5. Designed by Lantz Arroyo. This reflective sleeping bag can save your life and your friends. The key to survival is conserving body heat. This bag reflects body heat but unlike other sleeping bags, this is double the size and can easily fit two people. Since it is waterproof, it can also act as a liner for a snow cave. One double sized sleeping bag is better than two regular ones. The world is quickly becoming a frightening place. The growing threat of terrorism and weapons of mass destruction is widespread. Pandemics and emerging diseases loom. The dollar is devalued and foreign markets are looking for new global currency. Nanotechnology, biotechnology and related fields of emerging science hold promise of hope and peril. Philosophy is expanding to include transhuman dreams of redefining what it means to be human. Threats against personal liberties, foods and fuels are growing. Cults are witnessing unprecedented growth while Christianâ€™s around the world are witnessing ever-increasing persecution. Never before have people faced such fear-inspiring issues. 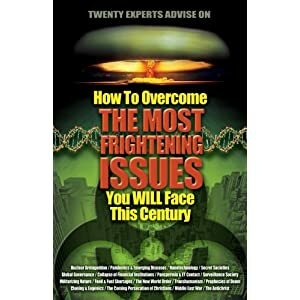 In â€œHow To Overcome The Most Frightening Issues You Will Face This Century,â€� 20 experts in fields of science, politics, warfare, finance, ethics, theology and prophecy offer experienced advice on how not only to survive these unsettling but to thrive. This pamphlet briefly looks at many of the reasons that Christianity is undesirable from both a personal and a social point of view. All of the matters discussed here have been dealt with elsewhere at greater length, but that’s beside the point: the purpose of 20 Reasons to Abandon Christianity is to list the most outstanding misery-producing and socially destructive qualities of Christianity in one place. When considered in toto, they lead to an irresistible conclusion: that Christianity must be abandoned, for the sake of both personal happiness and social progress. Trade paperback (US). Glued binding. 411 p. Audience: General/trade.